The identification, definition and management of key processes is an important element in understanding the value of the conservation interventions. however, most conservation leaders rarely even identify their core processes, let alone manage them for improvement. This shortfall has been repeatedly observed in organisational research in conservation (Black and Copsey 2014; Black, Meredith et al, 2011; Moore et al, 2018). It is more usual for work to be defined in strategic plans (often detailing activities to the fine details) and managed through work plans (including schedules and milestones). Success is often erroneously debated in terms of ‘activities completed’, objectives achieved’, ‘outputs’, or ‘outcomes’ and reported as such in formal reports and scientific papers alike, in the hope this provides some form of management wisdom. It barely provides a partial picture. Unfortunately these measures rarely reflect the fundamental nature of conservation, namely that it involves on-going and continuing efforts and outcomes. On-going activities need an understanding a knowledge of process. In process terms there is no difference between an ‘output’ and an ‘outcome’ – they just relate to sub processes and large (or further extended) processes. The boundary of the process defines the level of measurement. A poorly defined boundary could derive an effective, but futile process which pumps out good results but has no sustainable effect on its ecosystem of concern, such as a captive release programme which puts animals into a degraded habitat where animals only succumb to extant threats. Graham Caughley saw this as a major weakness in conservation in the 1990s, but the lessons are still not fully understood. The lack of process definition was a classic problem observed in the early years of the Black Footed ferret rescue programme (Black and Groombridge, 2011). A productive captive breeding programme was undone by releases which saw most animals die in a short time in the wild. To remedy this a wider process of reintroduction needed to be defined, which incorporated pre-release conditioning of the animals (e.g. aversion to humans and domestic animals), vaccination of ferret kits, vaccination of prey in the wild locations, as well as careful selection of release locations themselves. only when the total process was defined and measured for improvement did reintroductions start to succeed and predictably achieve the right results. 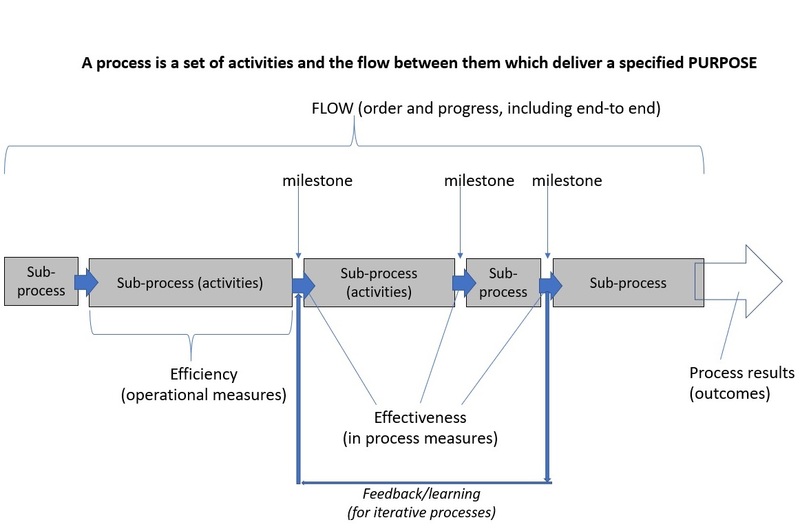 Flow is another key concept in process management – getting things in the right order. The Po’ouli succumbed to extinction as milestones for achievement were followed which did not meet the perilous status of the bird in the wild. Whilst huge (and commendable) effort was made to construct fenced habitat, free from invasive species, sadly the bird population itself fell into decline. There was no knowledge or effort or success in even considering breeding the birds, neglected until only three aged individuals remained (Black and Groombridge, 2011). Of course, to measure process performance (as opposed to project outcomes) you need an understanding of performance over time. this requires new measures and analyses of longitudinal data – Systems Behaviour. Only understand variation in process performance can give the helpful feedback insights needed to accelerate improvement in a timely and meaningful manner (Seddon 2003; Black et al, 2013). Anything other would be ‘trial and error’. Finally a conservation manager must define a process by the needs of the species and ecosystems of concern. Form a practical point of view this is likely to be driven by an understanding of threats – the ‘demands’ placed on the species. the process should then deliver something of value that addresses those threats. Anything less than value is just us, as humans, keeping ourselves busy. Being busy might make us feel better, but it is unlikely to ever help to conserve species and ecosystems. Black, S. A., Groombridge, J. J., & Jones, C. G. (2011). Leadership and conservation effectiveness: finding a better way to lead. Conservation Letters, 4(5), 329-339. Black, S. A., Groombridge, J. J., & Jones, C. G. (2013). Using better management thinking to improve conservation effectiveness. ISRN Biodiversity, 2013. Black, S. A., & Copsey, J. A. (2014). Purpose, process, knowledge, and dignity in interdisciplinary projects. Conservation Biology, 28(5), 1139-1141. Caughley, G. (1994) Directions in conservation biology. J Anim Ecol 63, 215–244. Seddon, J. (2003) Freedom from command and control. Vanguard Press, Buckingham, UK.